When a Catholic comes from confession, he does truly, by definition, step out into that dawn of his own beginning… in that brief ritual God has really remade him in His own image. He may be grey and gouty; but he is only five minutes old. Mgr. Ronald Knox heard confessions from the same confessional still used in Corpus Christi today. Confessions are heard for half an hour before all Masses, or upon request by making an appointment with Father. This page offers an overview of what Confession is – and what it is not – as well as a guide to making your Confession. Further resources are available from CTS Books. The Sacrament of Penance is such a gift! It can be very hard to do – it can be intimidating, embarrassing – but once absolution is given, you will walk out of that confessional feeling amazing. 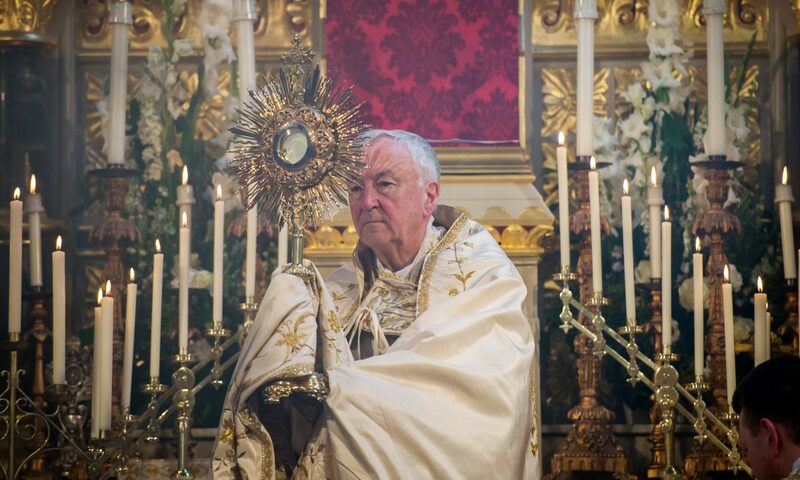 Christ, in His most Holy Wisdom, gave us this precious Sacrament to literally and truly bestow His grace upon us through His priests as a means of forgiving us and assuring us of His mercy and love for us. This psychological benefit of “feeling assured” and “clean again” stems not only from the supernatural fruits of the Sacrament, but from our human nature and our need to purge ourselves of those things that plague our consciences. Christ, the Great Physician, knows us well and knows that “confession is good for the soul,” in both a supernatural and psychological sense. Many people have been terrified to go to Confession; all that can be said is be a brave soldier and buck up and “just do it.” Christ Himself wants this of you, so just resolve to do the right thing. Millions of Catholics over the course of 2,000 years have braved the “little dark box” (at least metaphorically; though Confession has been around since Day 1, the Confessional is a 7th. century Irish gift to the Church); you can, too. Priests have heard it all, trust me, and nothing you say can ever be repeated to anyone in any way that could identify you – not to the police, not to another priest, not to anyone (a priest is automatically excommunicated if he were to violate the Seal of Confession)! And if you’re worried because you’re “new at this,”, or “it’s been such a long time” that’s okay! It’s okay to be nervous, it’s okay to be afraid because this is something new and different to you. And it’s okay to tell the priest how you feel. Just let him know it’s your first Confession; he will put you at ease and help you through it and be so glad you’ve come to receive the graces our Lord wants to pour out on you! It’s not as scary as it seems to so many people. Really. But if you’re still afraid, take a deep breath, pray for strength, go to Confession and receive His wonderful mercy! You will not regret it, I promise you! If you’ve just been validly baptised, you don’t need Confession, because Baptism wipes away all guilt of sin (and the temporal effects of sin, by the way). If, however, you were validly baptised years ago and are just now coming to this Sacrament for the first time, you might want to schedule an appointment with your priest to make what’s known as a “General Confession,” which includes sins of one’s entire life, since it might take a bit longer than usual (do the same if you are a returning Catholic and haven’t been to Confession for many, many years). “General Confessions” are also often made before marriage or ordination. Before we get to the church, we mentally review our sins and determine what needs to be confessed. There are various methods of doing this, but one good way is to consider your Duties to God, Church, family, society and to yourself to see where you’ve failed to honour them. A detailed way of doing this is provided in the “What to Confess: a guide to Examination of Conscience” section at the bottom of the page. A Catholic is required to go to Confession once a year (during Lent) and also at any time of the year he has mortal sin on his soul (is “not in a state of grace”), especially if he desires to receive the Eucharist. But weekly – at least monthly – Confessions are encouraged. Pope Francis has said he goes at least every two weeks. Contrition is wilful regret for one’s sins. It isn’t a matter of one’s “feelings” of guilt, but of conviction of the evil of sin and the resolution to sin no more. In other words, contrition is rooted in the will, not in the emotions. For example, some people are more emotional than others: some get a case of the “scruples” and feel shame or guilt over any little thing, whether it’s sin or not; others can have committed murder and never “wallow” in guilt but are still truly contrite. The one is not necessarily more “holy” or making a better Confession than the other. What matters is their conviction – their will to offend God no more, and their resolution to make reparations as far as possible, do their penance, and patiently bear the temporal effects of their sins. Without contrition, Confession is not valid. “Imperfect Contrition” (also called “attrition”) is regret out of fear of God’s just punishments for sin; “Perfect Contrition” is regret for having offended God. We must always strive for the latter, which always absolves sin in itself if it is coupled with the will to also receive the Sacrament. One of the keys to confession is the desire to be rid of all of one’s sins. If this is your will, if this is your desire, if you are willing to confess all of your sins and do your penance and resolve to sin no more, then your sins will be forgiven – all of them, even those you may have truly forgotten about. But don’t kid yourself, either, and think you can skip mentioning this sin or that one because you’re embarrassed. Don’t lie to yourself, to your priest, or to God, by omission. When you get to the church at the time the Sacrament is offered, you may or may not find a line of people standing or lined up in a pew near the Confessional. Just take your place in line, keeping a wide berth of the Confessional itself if it is occupied by a fellow penitent. Please note that it is very rude to be near the Confessional when someone else is using it! Though you don’t usually overhear anyone in the Confessional, it could feasibly happen. If this were to happen, the one who overhears should take all steps to not hear, and should never, ever repeat anything he might have heard. You can usually tell if the Confessional is free if you can’t see any feet poking out on the left side. When it’s your turn, enter the Confessional and kneel. You may barely see the priest on the other side of the grille (the screen which separates you). Don’t go into a lot of detail, don’t name other people who may have sinned with you, but do tell him what he needs to know in order to understand relevant circumstances of the particular sins – that is, circumstances that might mitigate your culpability or make you more culpable. For example, telling him about stealing a loaf of bread because you were starving will elicit a different penance and spiritual direction than if you tell him you stole a stack of money because you wanted to buy something immoral. If you are unsure as to whether a particular act was a sin, tell him. As you speak, he may stop you to ask you questions for clarification. Don’t panic if you later recall sins you forgot to confess: remember that if you were willing to confess them but simply forgot, they are forgiven if you will to confess them the next time you go. Now the priest will give you penance to help you pay for the temporal effects of your sins. He might ask you to say certain prayers (the old “Say three Hail Marys”), he may ask you to read certain parts of Scripture. If there is restitution to be made, he might ask you to do so. Whatever he asks you to do, accomplish it as soon as possible after leaving the Confessional. My God, I am heartily sorry for having offended you. I detest all my sins because of your just punishment; but most of all because they offend you, my God, who are all-good and deserving of all my love. I firmly resolve, with the help of your grace, to sin no more and to avoid the near occasion of sin. Amen. God the Father of mercies, through the death and the resurrection of his Son has reconciled the world to himself and sent the Holy Spirit among us for the forgiveness of sins; through the ministry of the Church may God give you pardon and peace, and I absolve you from your sins in the name of the Father, and of the Son and of the Holy Spirit. As soon as possible, carry out the penance you were given. Do all you can to avoid near occasions of sin, to bear patiently the temporal effects of the sins you’ve committed, to make restitution to anyone you’ve harmed. You may add penances of your own devising to the one(s) the priest gave you. Rejoice and be grateful! Consider what has been done for you! Savour the sweet knowledge that you are forgiven. Praise the Lord Jesus Christ, the Lamb of God Who takes away the sins of the world! He has said the word, and you have been healed! As indicated above, perfect contrition absolves sin in itself. Thus, if one is sorry for one’s sins but is trapped on a desert island without a priest, one needn’t fear if unable to confess in the normal way. We are bound by the Sacraments; God is not, and has many ways of pouring out His grace to us! Perfect contrition, though, includes the desire to obey God and not offend Him further – and God wants us to confess our sins to a priest. Therefore, if one can, one must go to Confession if there is a mortal sin to confess, or at least once a year. If one is unable to confess in the normal way, but would confess in the normal way if it were possible, then merciful God provides. grave matter: does it involve breaking one of the 10 Commandments, committing one of the Sins that Cry out to Heaven, or failing to uphold the 6 Precepts of the Church? full knowledge: did you know or should you have known that the act was sinful? deliberate consent: was your consent to this act sufficiently deliberate so as to be a choice? Were conditions present that influenced your ability to choose? If you are unclear as to whether a sin meets all of the requirements above for a mortal sin, be safe and confess it, telling the priest of your lack of clarity. As to venial sins (sins that don’t meet the above requirements), you are free to confess them or not. Confessing them is definitely encouraged, but do be mindful of the priest’s time and the time others need who may be standing in line behind you. If your Confession is before Mass, time is running short before Mass begins, there is a long line behind you, and you are wanting to confess venial sins only, you might want to hold off so that others who might have mortal sins to confess can see the priest before Mass starts. If you are plagued by feelings of “not being forgiven” or being “unworthy” of the Sacrament of Penance, don’t confess venial sins that you are doubtful about lest you find yourself with a case of “the scruples.” A “scrupulous” person is one who has “an unfounded apprehension and consequently unwarranted fear that something is a sin which, as a matter of fact, is not”. This doesn’t refer to isolated incidents, but to a habitual way of feeling or thinking, an unwarranted fear, a sort of emotional obsession; it doesn’t refer to true questions as to whether such and such a behaviour is a sin or not. Anxiety is involved, and often a felt doubt as to the power of confession, the genuineness one’s contrition, and the extent of God’s Divine Mercy. If you have a good Confessor, trust him and his advice, and tell him about any scruples you needlessly suffer from; he may be able to help you! And pray to St. Alphonsus Liguori, the great moral theologian who suffered from scruples himself and is now the patron saint of the scrupulous. For some practical advice in dealing with scruples, see “The Ten Commandments for the Scrupulous” written by Redemptorist priests. Begin by examining yourself on your last confession and Communion. Whether a grievous sin was forgotten through want of proper examination; concealed or disguised through shame. Whether you confessed without a true sorrow, a firm purpose of amendment and of repairing the evil done to your neighbour. See whether you received Holy Communion without devotion, or neglected to offer a proper thanksgiving. Whether the penance was performed without voluntary distractions. Whether you have neglected your confessor’s counsel, and fallen at once into habitual sins. Whether you have renounced all affection to mortal sin, or remained long in sin without eliciting acts of contrition and returning to confession. Then examine yourself on the Ten Commandments; the Precepts of the Church; the Seven Capital Sins; the duties of your state in life; and your ruling passion. Calmly recollect the different occasions of sin which have fallen in your way, or to which your state and condition in life expose you; the places you have frequented; the persons you have associated with, etc. etc. Do not neglect to consider the circumstances which alter the grievousness of the sin, nor the various ways in which we become accessory to the sins of others. The following short table will help you in your examination. 1. Have you doubted in matters of faith? – Murmured against God at your adversity or at the prosperity of others? – Despaired of His mercy? – Believed in fortune-tellers or consulted them? – Not recommended yourself daily to God? 2. Taken the Name of God in vain? – Spoken irreverently of holy things, or profaned anything relating to religion? – Sworn falsely, rashly, or in slight and trivial matters? – Cursed yourself, or others, or any creature? – Angered others so far as to make them swear, or blaspheme God? 3. Have you kept holy the Lord’s Day, and all other days commanded to be kept holy? – Bought or sold things, not of necessity, on that day? – Done or command some servile work not of necessity? – Missed Mass or been wilfully distracted during Mass? – Talked, gazed or laughed in church? – Profaned the day by dancing, drinking, gambling, etc.? 4. Have you honoured your parents, superiors, benefactors, according to your just duty? – Deceived them, disobeyed them? – Failed in due reverence to aged persons? 5. Procured, desired, or hastened the death of anyone? – Borne hatred; oppressed anyone; desired revenge; not forgiven; refused to speak to others; used provoking language; threatened or struck others not under your charge; made others fall out? 6 and 9. Have you been guilty of lascivious dressing or painting; lewd company; have you read immodest books; been guilty of unchaste songs, discourses, words, looks, or actions with yourself or others? – Wilfully entertained impure thoughts or desires? 7. Have you been guilty of stealing or of deceit in buying or sellings, in regard to wares, prices, weights or measurements? Have you wilfully damaged another man’s goods or negligently spoiled them? 8. Borne false witness, called injurious names; revealed another’s sins; flattered yourself or others; opened the letters of others; judged rashly; falsely suspected? 10. Coveted unjustly anything that belonged to another? Have you gone to confession at least once a year? – Received Holy Communion during Eastertide? Have you kept the precept of fasting and abstinence? Pride, Covetousness, Lust, Anger, Gluttony, Evil, Sloth. Wilful murder, the sin of Sodom, oppression of the poor, defrauding labourers of their wages.